If you have decided a pet skunk would be a good fit as a pet, the trickiest part may actually be finding a skunk. While sites featuring skunk breeders are few and far between on the internet, it is still possible to use the internet as a tool for finding a pet skunk. You should first check the legality of skunks in your area before going to the trouble of locating a breeder. Be sure you can find a vet that will vaccinate your skunk and treat it if it becomes ill. Acquiring a skunk if they are illegal in your area can lead to serious consequences, and even if it is just for vaccinations, your skunk will need veterinary care, and you will be stuck if you can't find anyone to treat your pet when needed. You might also want to consider taking in a homeless skunk from a shelter or rescue. Sometimes you might have to work a little harder to gain the trust of a skunk that ends up at a rescue due to neglect, but giving such a skunk a second chance at a happy home is a wonderful gift to the skunk! Perhaps the best way to find a skunk for adoption through a rescue association or a skunk breeder is to network with other skunk owners and ask for their recommendations. There are several email lists/groups that make this possible online. The Owners of Pet Skunks site maintains a list of such groups and would be a good place to begin the search. Skunk breeders can sometimes be found locally, although you may need to go a little farther away to find a good reputable breeder of pet skunks. You can check your local paper or even an agriculture-based newspaper in your area. Occasionally, depending on where you live, skunks can be found in pet stores. A breeder who breeds skunks as pets is the best choice, as long as the skunks are raised under good conditions and socialized well as kits. In many cases, the selling of skunks for pets is just a sideline for fur farms. This may be your only option, and you simply need to be educated and aware and evaluate any breeder or pet store by several criteria. When looking for a breeder, some patience is required. Skunks are seasonal breeders, and kits are usually only available in June-July. Many breeders have a waiting list and you may need to contact them a year or more ahead of time to get a kit. When you are choosing a breeder, the best option is to visit the breeder in person, as this is the best way to get a sense of how the breeder raises their animals. 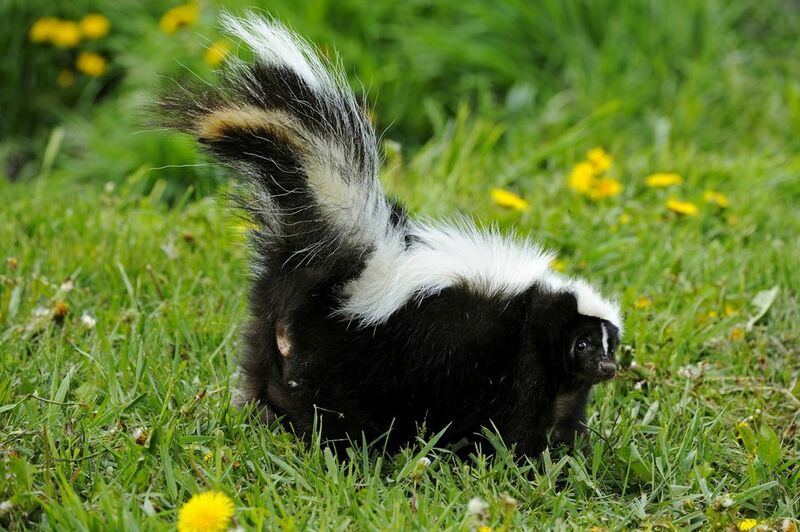 The skunks should be kept in clean conditions, which you should be able to assess by observation and odor. Do not be concerned if you are not allowed to see the breeding animals, as many conscientious breeders will not allow visitors access to breeding animals. Ask to see the breeder's documentation (licensing, inspection reports). Ask if there have been any disease outbreaks, especially distemper. Once you are satisfied with the facilities, carefully observe some skunks. They should be bright, alert, and curious, with a full shiny coat. They should be in good body condition, neither thin nor obese. They should be curious about visitors but not overly agitated. They should also have clean eyes, ears, nose and rear end, and no signs of lameness or other problems. Try to handle some kits to see how they interact with you. The best sign of a good breeder is one who is sure they are selling you a pet for which you are prepared. While you may feel you are being grilled, a breeder that asks potential owners lots of questions is one who is concerned that their animals are going to good homes. If a breeder can't answer all your questions about what skunks are like and how to care for them properly, be wary. Research care well in advance so you can tell if a breeder is giving sound advice or not. If you are some distance from a breeder, they may be willing to ship a kit to you. This is the least desirable option since shipping can be stressful. If you are looking for a skunk, be prepared and most importantly be patient so you can be sure you are getting the pet that is perfect for you. How Do You Find a Vet for Your Exotic Pet? Are Giant Land Snails Pets or Pests?